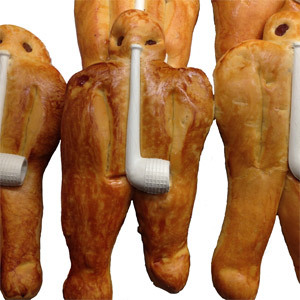 A popular sweet treat eaten on and around St. Martin's Day (November 11th) the traditional Weckmann, a sweet bread roll shaped into a gingerbread man form with raisin eyes and a white clay pipe in his mouth. The Weckmann can be purchased in the majority of German bakeries in regions where St. Martin's Day is celebrated or can be made at home. Mix yeast with warm water and 1 tablespoon of sugar. Place flour in a large bowl, make a well in the middle of the flour and pour yeast mixture into the well, cover and let rise for 20 minutes. Combine milk, butter, shortening, and sugar in a saucepan and heat gently then set aside to cool. Mix 4 eggs with vanilla extract and lemon peel and beat until smooth. Add to milk mixture once cooled down. Roll dough and divide into 10 pieces to form into gingerbread men shaped Weckmänner. Place the Weckmänner on a large baking sheet covered with baking or wax paper, making sure to leave enough room between each shape. Let rise for a further 20 to 45 minutes. Brush Weckmänner with egg/water mixture, decorate with raisins and dried cranberries for the eyes and buttons. Bake at 325 to 350 degrees F for 10-15 minutes.